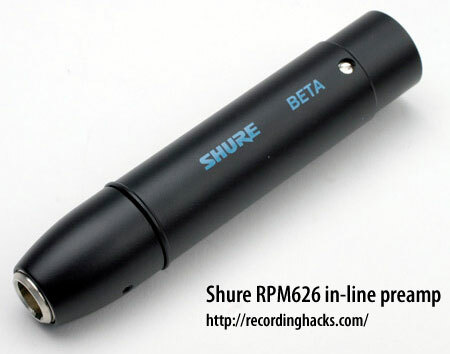 The mic has a unique two-piece design, in which the inline preamp (Shure p/n RPM626) is housed separately from the capsule housing. As the successor to the SM98A, the Beta 98 features several improvements. Dynamic range is 4 dB greater, as is headroom, while maximum SPL is 5 dB higher (now 160 dB!). Physically, the mic utilizes a thicker detachable cable. The A98D gooseneck drum mount has been redesigned for quicker, more secure rim-mounting without the need for a drum key. The Beta 98 ships with an inline preamp (RPM626) and the necessary cable to connect the capsule to the preamp, a soft case (26B21), and either a swivel mount (for Beta 98/S) or gooseneck rim mount (for Beta 98D/S). 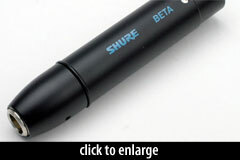 The Shure Beta-98 is also known as: Beta-98D-S, Beta 98D-S, Beta98DS, Beta98S, Beta 98S.